Fun times in Hope&Glory this week as we made the most of the Christmas season for our clients at Virgin Trains. Some folk might remember that last year we created the rather marvellous #Traindeer, a train design created by school children up and down the West Coast line for Virgin Trains. Well this year, because we now work with the lovely people at Virgin Trains East Coast as well as those who serve the West Coast route, we got to do the whole thing twice over as we launched a Christmas train design on each of the lines. Weirdly, this is a campaign was born originally of a social media brief – come up with something to get people talking about the company at Christmas in social channels. Given that millions of people use Virgin Trains on a weekly basis, our insight was to do something with the trains themselves that would activate existing customers and that we would reach their social circles as a result. That was (broadly) the same strategy we deployed this year. So back in the summer, kids were asked to come up with designs for a Christmas train in a partnership with the Book Trust and author and illustrator, Jill Murphy. 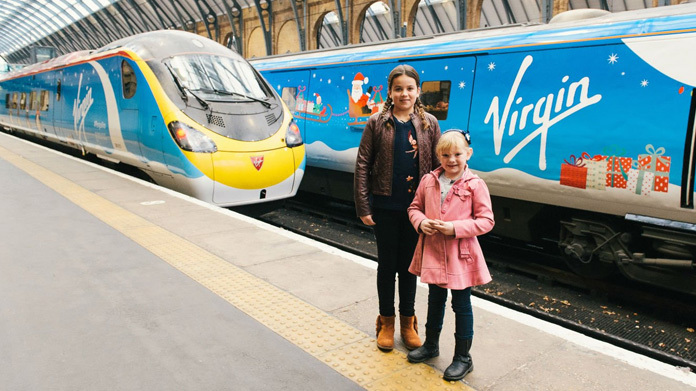 This week, we unveiled the two designs at a special event at Kings Cross Station – special not least because we had to arrange for a Pendolino from the West Coast route to travel across north London so that both of the festive locomotives could be shown off together. The whole thing has had some splendid coverage along the way, including national coverage across the Daily Mail, The Sun, Daily Express, METRO, BBC News and the Independent. Vitally for Virgin Trains, we’ve also secured stand-out pieces across the regional media with around 120 pieces along the route and full page belters in the likes of the Manchester Evening News, Newcastle Journal, Edinburgh Evening News, Liverpool Echo, Birmingham Post, Welsh Daily Post … the works. What’s more, the social chatter has already (one week into the trains’ six week run) gone nuts. There have been around 6,400 tweets about the Virgin Christmas trains from 4,500 people and those have reached 13 million and delivered over 34 million exposures. The numbers are mind boggling. Just what was planned.